It’s no secret that the landscape is difficult for independent media. Well, there’s one way to SAVE it. And that’s to support it. 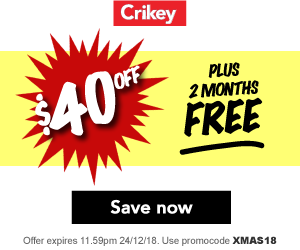 Use the promocode XMAS18 when you subscribe, renew or give the gift of Crikey today and as well 12 months of Australia’s best independent journalism, and you’ll save $40 on our usual price, plus we’ll throw in an additional 2 months for FREE. If you have questions about your membership, processing a renewal, Crikey Christmas gifts or more, click here. For Crikey terms and conditions please click here.